Other than the name and J.J. Abrams’ magic touch, I’m not sure what this has to do with the original Cloverfield (2008). 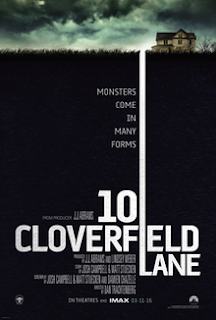 There is a brief moment in the film where for a few frames, an address sign proudly proclaims “10 Cloverfield Lane” but other than that, I don’t see a big connection. The aesthetic is completely different (gone is the found-footage style of the original) and I am actually thankful for it. Shaky-handheld-cam is so 2008. Who even uses camcorders anymore? Maybe a true sequel should have been filmed on Snapchat and it would be gone from cinemas after the first time you watch it. Thankfully, this has a lot more in common with things like The Mist (2007) and maybe Prisoners (2013) and Doubt (2008). The psychological thriller aesthetic takes center stage, with a stellar performance by Goodman. Winstead was ok too, trying hard to shed the remnants of the Manic Pixie Dream Girl that she inherited from 2010’s Scott Pilgrim vs The World. She is a sort of badass version of Brie Larson in Room (2015) but with a little less drama and a little more badassery. Overall, I liked the ambiguous nature of the plot, always keeping you guessing where it is going. The ending didn’t disappoint, although not entirely unpredictable, it did feel somewhat satisfying and didn’t leave me hanging (not to say that open-ended films are bad). Considering this is Trachtenberg’s directorial debut, I’m curious to see what’s next in store for him, as this is a very promising start.